January is Hobby Month and we have added some Combo Deals that will get you going on converting your minis. ProCreate sculpting putty is also discounted all month. January’s New releases include Gillie the Sea Creature and Torthos the Turtle Musketeer. We’ve also added two new weapon sprues for Counterblast along with a FREE PDF with rules for the Mack’s Bot Crew Combo. The new version of the Counterblast rules v1.5 is available as a free download PDF. We have also created a new Crew Combo PDF featuring all the rules for Mack’s Bot crew. 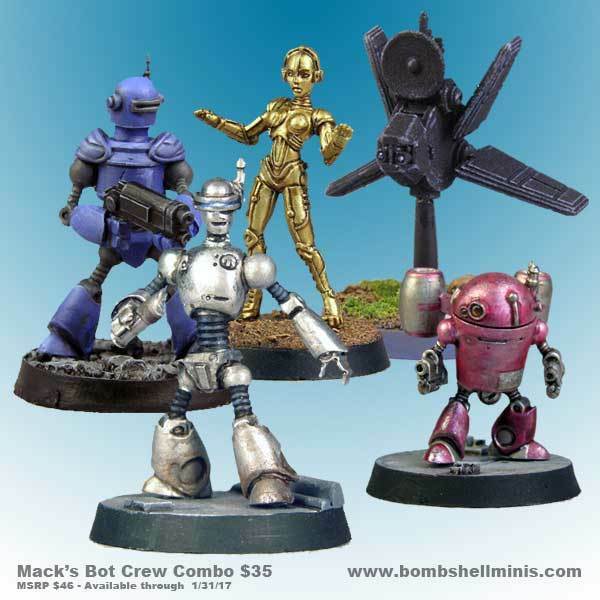 This month we spotlight Mack’s Bot Crew for Counterblast. This Crew Combo comes with a FREE download PDF of all the rules for this crew in Counterblast. Check out our all new Counterblast Facebook group. The new Counterblast group is for sneak peeks, rules discussions, mission briefings, battle reports, as well as other hobby stuff as we prepare for the new AdeptiCon debut.